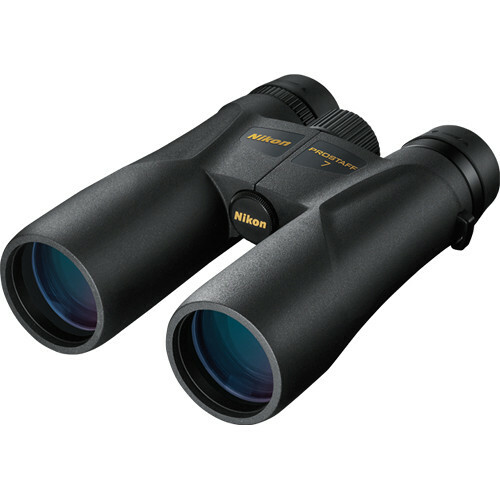 The 8x42 ProStaff 7 Binocular from Nikon is a full-featured general purpose set that combines a weather-sealed housing and a fully multicoated Eco-Glass optical path. In addition to the multi-layer coated lens system, ProStaff 7 optics also have phase-corrected roof prisms that preserve sharpness and color fidelity. A highly-reflective mirror coating also allows the prisms to maximize brightness and clarity of the transmitted image. Nikon's Eco-Glass optics include environmentally-friendly lenses and prisms that do not contain lead or arsenic. Turn-and-Slide eyecups with multiple click-stop positions complement the 19mm eye relief, which can provide a comfortable viewing distance for almost and viewer. A nitrogen-filled fogproof housing wrapped in slip-resistant rubber armoring makes the ProStaff7 binocular ready to endure rain and snow. Additionally, a compact bridge and ergonomically located gripping ridges prepare this set of glasses for comfortable and secure handing. 56 - 72 mm / 2.20 - 2.83"